The shelf strip measures 1.22" x 47.75" x .010". Prices decrease as volume increases. Store will automatically calculate discounts.1,000 strips per case, for quantities of 900 or less, please see the 100 count section. Shelf Chip, 1.22" x .010" x 2.25"
Chip measures 1.22" x 2.25" x .010". Prices decrease as volume increases. Store will automatically calculate discounts. 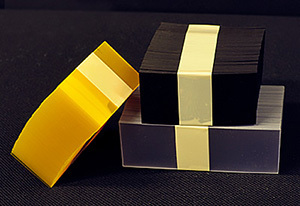 Shelf Chip, Transparnet Colors, 1.22" x .010" x 2.25"
Chips measure 1.22" x .010" x 2.25" and are available in a wide range of solid and transparent colors . Initial price displayed is for 1,000 chips (minimum purchase); please select quantity you require from dropdown box and price will adjust. Note that per chip price decreases as quantities increase. 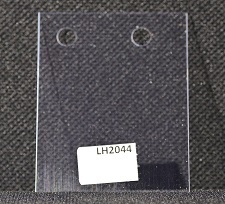 Shelf Chip, 1.22" x .0075" x 2.0"
Chip measures 1.22" x 2.0" x .0075". Prices decrease as volume increases. Store will automatically calculate discounts. 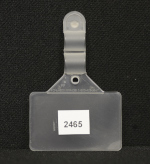 Shelf Chip, 1.22" x .0075" x 2.25"
Chip measures 1.22" x 2.25" x .0075". Prices decrease as volume increases. Store will automatically calculate discounts.